The Ultimate Baked Spaghetti - cheesy spaghetti topped with Italian seasoned cream cheese, meat sauce and mozzarella cheese - SOOOO good! Makes a great freezer meal too! We ate this two days in a row! I called this The Ultimate Baked Spaghetti because I combined two of my favorite baked spaghetti recipes and made one great recipe. The "ultimate" if you will. This was crazy good. I wanted to eat the whole pan! We ate this for dinner and again lunch the next day. 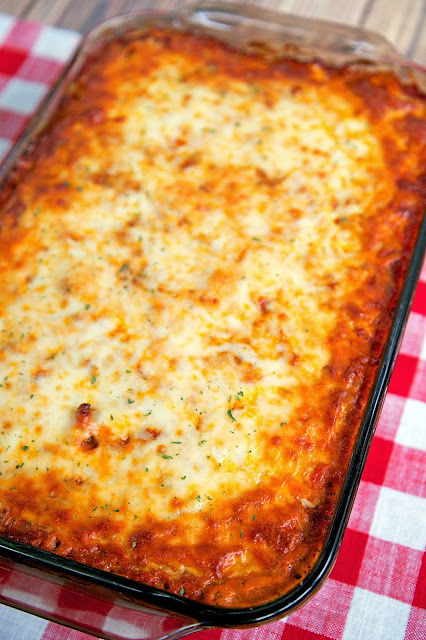 This Ultimate Baked Spaghetti is very easy to make. Start the spaghetti cooking. While the spaghetti is cooking, whisk together the eggs, parmesan, and melted butter. Toss that with the cooked spaghetti. Top the spaghetti mixture with a combination of cream cheese, sour cream, garlic, and Italian seasoning. Finally, top everything with some cooked Italian Sausage or ground beef and jarred spaghetti sauce. You can make it in advance and refrigerate until ready to bake. I get a lot of questions about which jarred spaghetti sauces I like to use. Here are three of my favorites. 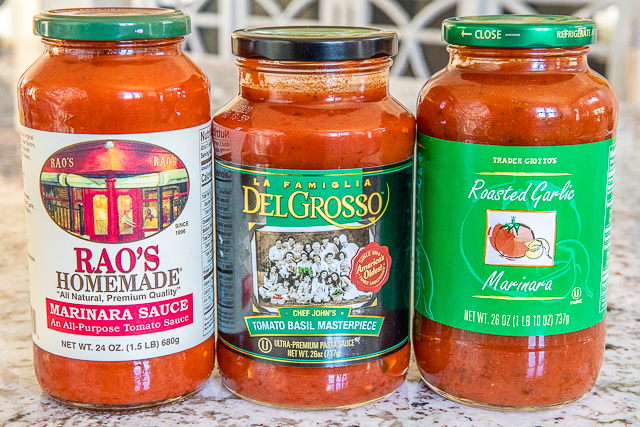 They are all great, and I use them for all of my recipes that call for jarred spaghetti sauce. Absolutely! This Ultimate Baked Spaghetti also freezes well. You could even split the recipe into two 8x8 foil pans - bake one now and freeze one unbaked for later. When ready to bake the frozen baked spaghetti, thaw completely and bake as directed below. For the leftovers, I cut them into single serving squares and freeze them wrapped in plastic wrap. When ready to eat, just thaw and pop in the microwave. Perfect for a quick and easy meal later! This makes a ton. It would be great for a potluck. 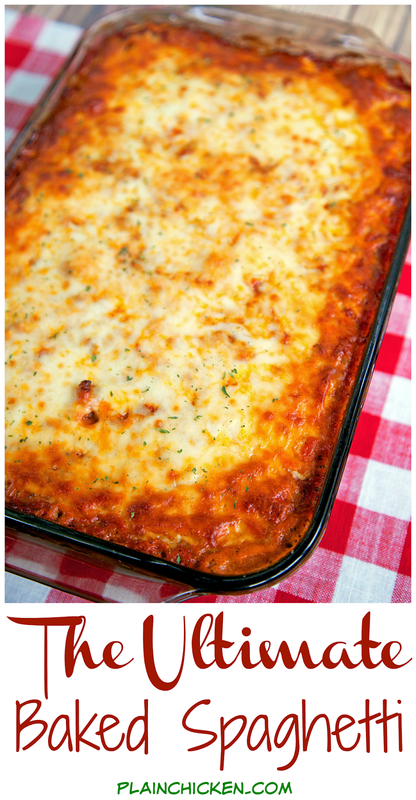 You can serve about 12 people with this Ultimate Baked Spaghetti Casserole. If you have a large crowd, just double or triple the recipe. You can make this in advance, so it is great for parties! Serve this with a simple salad and some garlic bread for an amazing Italian feast! Cook spaghetti according to package directions. Drain. Whisk together eggs, parmesan cheese, and melted butter. Toss with pasta. Place in prepared pan. Combine Italian seasoning, garlic, cream cheese, and sour cream. Spread over pasta. Combined cooked sausage or hamburger and spaghetti sauce. Spread over cream cheese mixture. Top with 2 cups shredded mozzarella cheese. Bake for 45 minutes, or until cheese is melted and bubbly. I just clicked on the link and it worked for me. Maybe it was a temporary glitch. Definitely try again. I definitely like your version of spaghetti. Looks tasty and I like it can be frozen. Jackie - I used Trader Joe's Roasted Garlic sauce. Oh my gosh this looks and sounds delicious. Printing now to save for when my diet allows a little over indulging. I just finished eating some of this. It is very good and very rich. Thanks for sharing the recipe. Is there a way to make this without the spaghetti sauce? Hi there! To freeze this - do you bake, then freeze and reheat? or freeze unbaked, thaw and bake? I freeze unbaked, thaw then bake. I made this last night & it was SO good! A big hit with everyone! And it's so simple too. What a great combination - delicious & easy! Definitely a keeper! Thanks! My family and I are obsessed with this bake! I found myself going back for 2nds, 3rds and 4ths. Super rich and easy to make. I ran out of time and the fam was hungry so I upped the temp to 400 and baked for 20 and it came out perfect. Thanks so much for making and sharing! I cooked this last night but want to reheat it for friends in the next day or so. For how long do you recommend I cook it and at what temperature? I'd probably cook it covered at 350 degrees for about 25 minutes. I made it today and it would have been better if I would have mixed the noodles with the meat sauce. As I am on summer vacation it is always my mission to begin trying new recipes that will be delicious, easy for the work week and be enough to feed us for two days. This recipe checks all my needs. I made it tonight and it was incredibly delicious. My husband raved over it and said that this recipe definitely needs to be a part of our menu. Thank you for sharing! Just wondered if anyone has mixed it altogether and baked it. I thought the pasta might get dry without the sauce mixed in. Also my husband isn't a fan of cream cheese and sour cream and I thought it would be less recognizable to him that way. It won't help mixing it. He will still taste both even mixed together. Plus mixing it would ruin this dish. You could make two pans of it though one with the creamy layer, one without. Cook both then freeze half of each for another dinner. The pasta isn't dry at all. The egg/butter/Parmesan mixture makes it firm but moist. Too bad hubs doesn't like cream cheese or sour cream though, that makes this dish really good. It's been awhile since I had a chance to make any of your great recipes but I just made this dish last night and I am thinking that my "thin" spaghetti wasn't thin enough because I ended up with too much of the spaghetti layer and my pan was full before I could get to the meat sauce part so I improvised and luckily had enough extra everything to make two 1/3 full pans lol One for us and one for my Mom and Brother who LOVED it. What brand did you use for your noodle? Lawanda, when I make this or any other baked spaghetti recipe I mix mine together. I think it turns out better that way. But I mix all the ingredients together except the mozzarella and some of the parmesean cheese and layer that over the top. It turns out great and doesn't mess the recipe up. Some times I spread a little sauce on top before the cheese layer. I made this for hubby and myself earlier in the week and it was wonderful! While preparing, I divided everything evenly into two 8x8 pans and froze one (without the mozzarella cheese on top) for another day. We both loved the combination of sour cream and cream cheese with the spaghetti and sauce. I used plain Ragu sauce but next time will use a more flavorful sauce or doctor it up some. When we reheated the leftovers the next day, I added garlic and onion powder, bit more mozzarella and just microwaved it. It was better the second time around! It is rare for me to find a "casserole" hubby likes but this one is definitely going to appear on the menu every few weeks. Thank you for sharing! I was wondering do I cover the spaghetti up in foil before I put in the oven ? and should I put the spaghetti on the top shelf or the bottom shelf in the oven?? I bake it uncovered on the middle rack in the oven. Enjoy! Made this tonight and it was really delicious! The only thing I did different was add diced onion to the ground beef, but thatsca personal preference. Thank you for sharing! I really like this recipe! Mine was a little dry & the spaghetti stuck together.....is that normal? The mozzarella cheese burned a little on the edges...should I not bake it as long? LaKeshia - I've never had issues with the spaghetti being dry. Maybe try and cook it a minute or two less than the directions on the package. If the cheese is getting too browned, try covering the dish during the last few minutes of baking. This is one of mine and my husband’s favorite dinners so I’m going to make a couple pans for a big get together we’re having tomorrow. Would it be ok to make the pans tonight and keep in the refrigerator for 24 hours? Also, how much do you think I need to increase the cook time for 2 or 3 pans? How long can you freeze this? Thaw in refrigerator; bring out for how many mins. to come to room temperature and would you bake it at the same temperture and time. 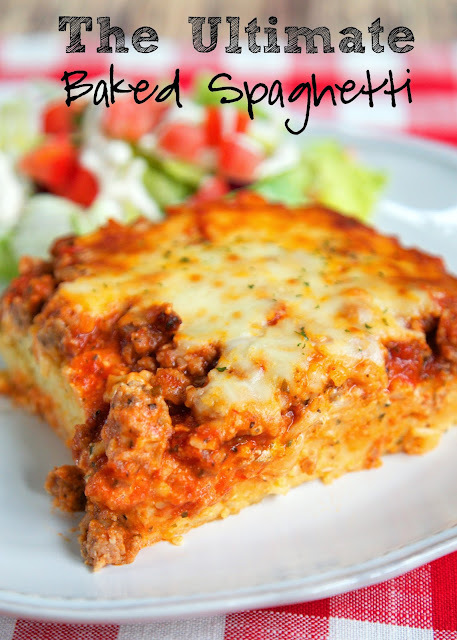 I just made this baked spaghetti and it was a hit.my husban love it .I will definately be making this again.I have never had baked spaghetti before. This looks awesome! Do you think I could make this with shredded chicken instead of sausage? Can anyone tell me where in aus I can get the Italian sausage from please? Is 350 degrees for Australia also? WE MADE THIS LAST WEEK EVERYONE LOVED IT MY HUSBAND BRAGGED TO EVERYONE THAT WOULD LISTON HOW AWESOME IT WAS.........AND IT WAS!! !